I've been really sick for the past four days and the only thing I was dreaming about was summer time. I usually spent summer in the South of France with my family and friends and my mum is always used to make one of these veggies tart so healthy, light and delicious. Therefore, I called her and asked for the recipe in order to make one at home and maybe to bring summer earlier. This recipe is completely vegan, very light to digest and incredibly delicious. A slice of two of this tart perfectly goes along with a large salad on the side and as you can see in the picture with a glass of water with slices of cucumber in it to be completely detox! On a small sauce pan on medium heat, add a tablespoon of olive oil and cook the zucchinis for about 5 minutes. Meanwhile, in a blender, chopped the brazil nuts and add all the remaining ingredients. Once the zucchinis cooked, add them to the blender and mix until everything is combined and creamy. In a large sauce pan, on medium heat, add two tablespoons of olive oil and start cooking the garlic for 2 minutes. Then add the slices of eggplant, mushrooms and cherry tomatoes and cook it until they become golden crispy. Once everything is ready, take the tart crust out of the fridge. Dust a clean surface with flour and roll out your tart crust until it shaped in a circle of 25 cm. (The size of your tart pan) Quickly and carefully take the tart crust down right into the edges of your pan. Use a fork to pick into the crust to avoid bubbles. 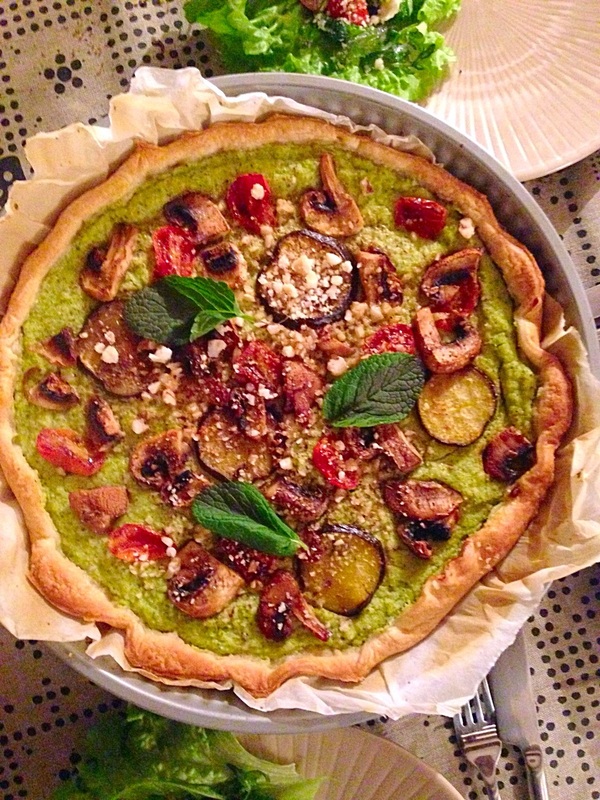 Add the creamy zucchinis base onto the tart and spread it evenly over the tart crust. Add the roasted veggies on top of the zucchini base. Put it in the oven for at least 25 minutes.